Following our blogs about BP's damaged oil rig being offshore in more ways than one, we are intrigued to see this letter sent by Senator Grassley to the chair of BP. "The Deepwater Horizon rig is operating under the flag of the Marshall Islands. I would like to understand if this shelters BP from rigorous oversight." Please explain the benefits/drawbacks of having an oil rig off the coast of theUnited States flying under the flag of a foreign country. Specifically, how does this affect safety inspections, taxes, and royalty payments? 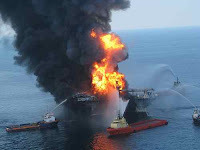 Please provide a list of all BP oil rigs operating in the Gulf of Mexico and flyingunder the flag of a foreign country. Please provide the name of the oil rig, its distance from the United States coast, and the name of the country under which the rig operates. Please provide an accounting of all tax breaks and/or subsidies that BP received from the Federal Government for the Deepwater Horizon rig in the Gulf of Mexico. The time span of this request covers January 2005 to the present. Please provide an accounting of royalty relief that BP has received for offshore oil drilling in the Gulf of Mexico. The time span of this request covers January2005 to the present. Transocean, which owns the rig, received a similar letter. Very interesting. Did these questions ever receive an answer?